After something of a hiatus, CotM is back! Regular users of the site may have been worried that this section hadn't been updated for nearly six months, however it is a much loved area of the site and it is very much my intention to go into article writing mode to try and get us back up-to-date. We have been writing about catfishes since the 1990's, so one a month means that it is increasingly harder to find commonly available catfishes to talk about. However, this month, we have found one. In truth, I didn't need to look far. We have, to date, often avoided writing about L-numbers that are not described because, when they are described, it rather dates the article. However, the information about keeping and breeding species doesn't change and should remain useful. Furthermore, it is interesting for some to find out what we knew, and when, regarding an individual species. This month we are going to look at the commonly available Peckoltia sp. L205 – it is a species with an indistinct body pattern and distinctive dark spotting on the head. It is often sold as Peckoltia brevis, but this is most likely an incorrect point of view. LaMonte described Peckoltia brevis in 1935 from a single specimen originating from the Rio Purus in Brazil that was collected the previous year by one Boris A. Krukoff. It is very likely indeed the material used to described the species had therefore been preserved for a few months at least before LaMonte first saw it - typical practice for that time. While we're talking about P. brevis, it's interesting to note that the description was from a single, dead fish, 91mm SL long with the end of the dorsal fin missing. LaMonte also noted that the teeth were, "on one ramus, very sharply hooked" and she observed "this species is deeper than [Peckoltia] megacephalus". Not a huge amount to go on, so it's really on the line drawing accompanying the description that will stick in our minds. Anyway, back to L205. It belongs to a batch of L-numbers from the Peruvian Rio Ucayali and introduced in DATZ in March 1996. However, it must be remembered that DATZ had a globally narrow distribution only ever being published in German and distributed by retailers and post only. Furthermore, L-numbers only gained global usage in the internet age just before the turn of the millennium. The linking of the name Peckoltia brevis with "the Peckoltia with the spotted head "probably came about because "back in the day", before the internet and before PlanetCatfish.com, the single biggest source of catfish images was the TFH published, Burgess Atlas of Freshwater and Marine Catfishes. Even with an honourable mention of Sands' five volumes Catfishes of the World, Burgess' gargantuan tome was an epic work, never bettered in print for the range and depth of siluriformes presented within. Published in 1989, it was the go to book when trying to find out what a mysterious new import was. And it was to a picture labelled Peckoltia brevis from "Tropical South America" that we went to. 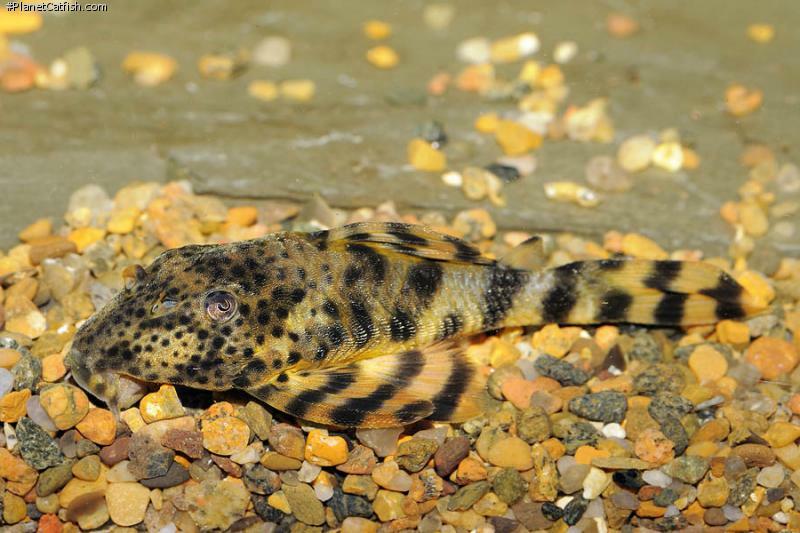 That image showed a fish well matching the one turning up for sale from time to time and, given known pleco diversity was a lot less then than now, seemed a good match to LaMonte's P. brevis. And so the name stuck - this story happens all the time - but corrections are made when new information is known as is now. Panaqolus albivermis, L204, has become one of the most popular l-numbers over the last two decades. L204 and L205 share the same collection style and trade route from river into our tanks and so has become a regular, if less frequent, import than the pretty Panaqolus. The continued use of the name Peckoltia brevis (for a very similar fish) was guaranteed by this fish continuing to appear. This misidentification was not helped, admittedly, by this website not looking at the fishes closely enough either. We have now split L205 from P. brevis on the basis they are from very different geographic locations. I have fishes from both locations and, as a quick rule of thumb, we can also say that the arrangement of the striped body patterning is entirely useless for species determination. What is useful, if not 100% accurate, is the range of the spots on the head. In P. brevis they do not pass much beyond the gills on adult fish, in L205, the full head and some of the upper body past the base of the dorsal fin ray is spotted. However, what other fishes are imported with these fishes remains the most reliable quick clue. Keeping L205 is straightforward, they are unfussy omnivores and will do well on standard prepared foods as long as they are not rich. They are, as Peckoltia go, also more tolerant of a higher pH due to their origins. Being Peckotia, they require a few caves and refuges to retreat to but will venture out and about in a shady tank with other fishes for company. In writing this CotM, I am reminded how much fun it is to write about fish; PlanetCatfish has its origins in my (and others) desires to write about fish, so getting back to basics is rewarding. Next one soon!